In 2012, the World Challenge Championship kicked off its twenty-third consecutive season at St. Petersburg, Florida in March as a support event for the IndyCar series. 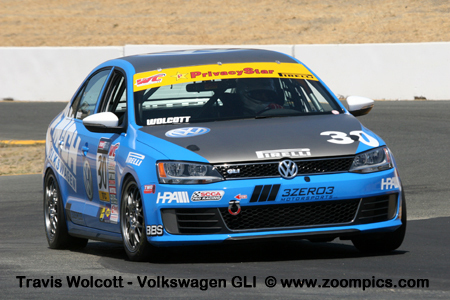 The season ended late-August at Sonoma Raceway. In between these two events, there were races at Long Beach, Mosport, Miller Motorsports Park, Detroit, Mid-Ohio and Mazda Raceway Laguna Seca. Grand Touring (GT) – This group included the series quickest cars: Porsche 911 GT3, Chevrolet Corvette, Dodge Viper, Cadillac CTS-V.R, Nissan GT-R and Volvo S60. The preparation rules remained unchanged from the previous year. These vehicles produced more than 450-horsepower. Grand Touring Sport (GTS) – The cars in this class are not permitted the same level of preparation as the GT category. The class is a mix of cars that would be best described as sports cars or sports sedans. Vehicles eligible to compete in GTS include SCCA Club Racing Touring 2 cars and some FIA GT4 cars. Makes competing in this category include the Ford Mustang, Porsche Cayman, Chevrolet Camaro, Kia Optima and Acura TSX. Touring Car (TC) – The preparation of the Touring Cars was closely aligned with Grand Am Cup and the Sports Car Club of America’s Improved Touring classes. The wide range of vehicles homologated for this category meant that power output ranged from 180 to 260-horsepower. Also, there was significant variation in drivetrain configurations – front-wheel, rear-wheel and all-wheel drive. 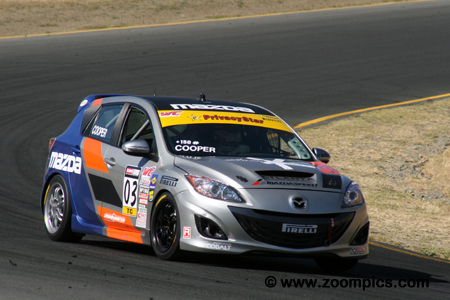 Makes competing in the category included the Volvo C30, Mazda RX-8, Honda Civic Si, MAZDASPEED3, Volkswagen Jetta and Golf. Touring Car B (TCB) – World Challenge’s newest class was implemented to allow competitors to compete at the professional level in cost efficient cars. To keep expenses down, modifications were limited to performance spring and shock packages offered by the manufacturers. 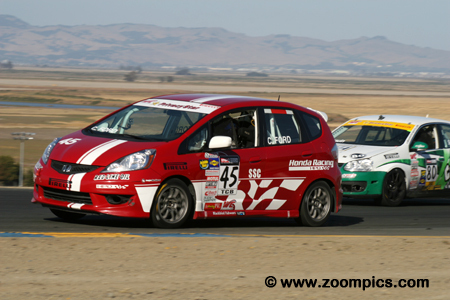 Makes competing in TCB were the Kia Rio, Honda Fit, Mazda 2, Fiat 500 and Mini Cooper. GT and GTS classes were combined to race in 50-minute timed events. The TCB cars ran two 25-minute races with a 15-minute break in between to allow crews to make minor adjustments. The following day there would be a longer 40-minute race. Rounds 12, 13 and 14 at Sonoma Raceway’s twelve turn road course would mark the season finale for the World Challenge Touring Cars. Pole-sitter Michael Cooper leads a field of twelve Touring Car and six Touring Car B competitors into corner two on the first lap of round twelve. 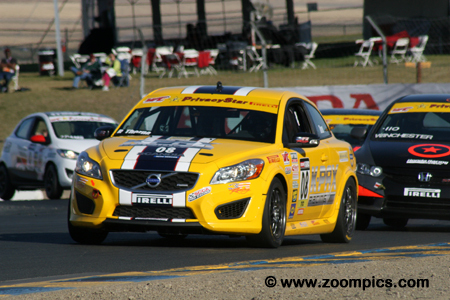 Immediately behind Cooper is the Volvo C30 of second place starter Robert Thorne and Todd Lamb who qualified the Compass 360 Honda Civic Si third. Second in Touring Car points and a chance to secure the title was Todd Lamb driving the No. 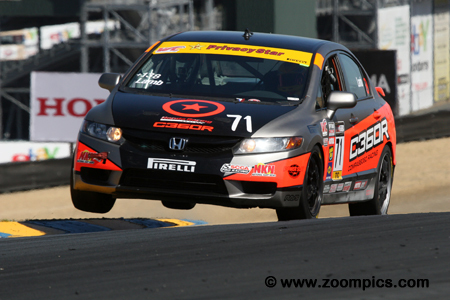 71 National Karting News Honda Civic Si. Lamb was coming of a win at Mid-Ohio and started third on the grid in the weekend’s first race. He finished second in round-twelve and in round-thirteen scored a victory. In the season ending event, Lamb was second at the checkered flag and finished 108-points behind Cooper. Michael Cooper entered the series final weekend as the Touring Car championship leader. He started off his title hopes the right way by winning the pole-position for the first race of the event. In Saturday’s first race he dropped to sixth place but was third at the finish and in round thirteen was second at the checkered flag. In the finale, Cooper took the victory and the Touring Car title. 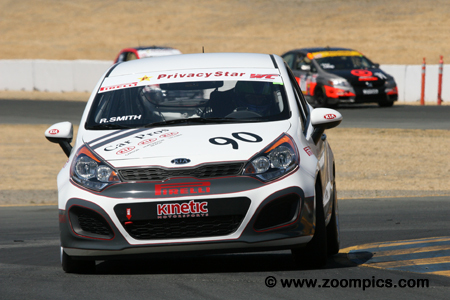 Quickest in Touring Car B qualifying was Russell Smith driving the Kinetic Performance Parts Kia Rio – his time put him thirteenth overall. On Saturday Smith traded first and second finishing positions with Connor Ford. Smith was second in the weekend’s first event and first in the second race. On Sunday he was 0.948-seconds behind his teammate and class winner, Jeff Lepper at the checkered flag. 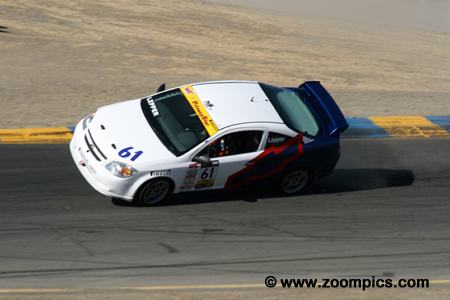 Providing the most excitement during the weekend was Tom Lepper driving a Chevrolet Cobalt SS. Lepper exited the track just before corner two. Returning to the racing surface, he performed a two-wheel move that would have earned him a spot in the ‘Joie Chitwood Thrill Show’. After a successful landing, Lepper finished tenth. In rounds thirteen and fourteen he finished tenth and sixth, respectively. The No. 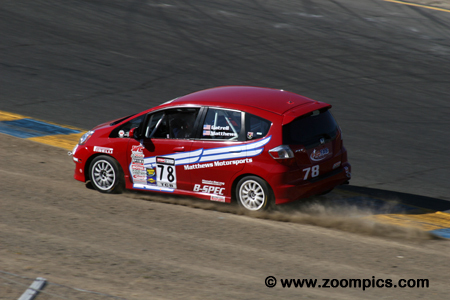 78 Matthews Motorsports/HPD Honda Fit was driven by Steve Gatrell. Gatrell started from the third position in Touring Car B and finished third behind Smith and Ford in both of Saturday’s races. In the season finale, he started third in class and was fourth at the checkered flag. 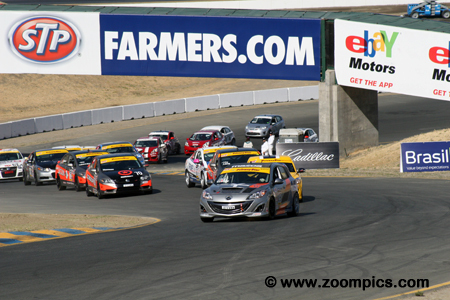 In 2012, the K-Pax Racing Volvo C30s sat idle until the season finale at Sonoma. One of the Volvos was entered for youngster Rob Thorne. In his first World Challenge event Thorne qualified second but before the end of the first lap Thorne was out front and led flag to flag for his first World Challenge win. His pace in the first race abused his tires and he finished seventh in the second event. In the final round, Thorne was seventh. Starting second in Touring Car B was Conner Ford. Ford had entered the first event of the season a Miller Motorsports Park - with his best result being a second in round three. In Saturday’s first race he took the lead on lap-1 and cruised to a 7.475-second win – in the following race he was second behind Russell Smith. Sunday’s event saw Ford start second in Touring Car B and finish third in class. A late entry in Touring Class B was Jeff Lepper. 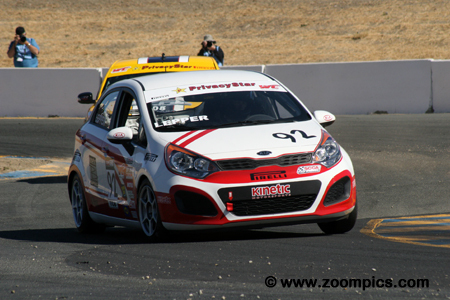 Lepper had some laps in the Kinetic Performance Kia Rio at Miller Motorsports Park and as a local a lot of experience competing at Sonoma Raceway. Starting last in the field he worked his way into the lead on lap-13 of the 40-minute event. Lepper held on for the class victory and won the Sunoco Hard Charger Award. Touring Car B points leader Jonathan Start qualified sixteenth overall and fourth in TCB. 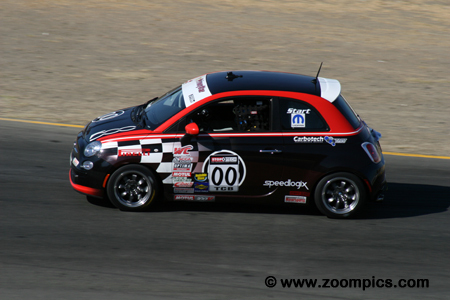 The Fiat 500 driver collected fourth and fifth place finishes on Saturday. Start’s consistency during the season paid off as he scored enough points in round thirteen to win the Touring Car B Driver’s Championship. With the title wrapped up, Start took the Touring Car B checkered flag in fifth place. 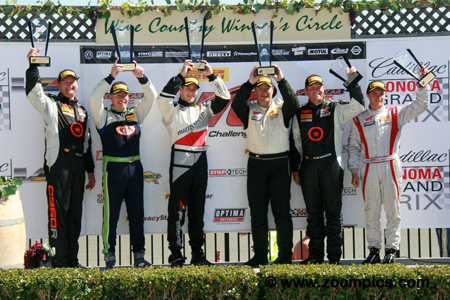 The final podium of the 2012 World Challenge season. Left to right – Second in the race and Touring Car standings – Todd Lamb. Next to Lamb is Russell Smith who finished the weekend with two seconds and a first in Touring Car B. Beside Smith is the new Touring Car champion, Michael Cooper. He is followed by the Touring Car B race winner – Jeff Lepper. The last two drivers on the podium are Ryan Winchester and Connor Ford who finished third in Touring Car and Touring Car B, respectively. All content (photographs and text) appearing on this website are the exclusive property of © www.zoompics.com and are protected under International copyright laws. The subject matter on this website may not be reproduced, copied, stored or manipulated.